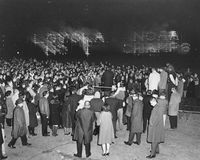 Signs celebrate the Loyola championship team. 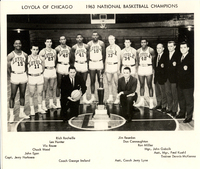 Loyola's Mens Basketball team, the 1963 National Basketball Champions pose with thier championship trophy. 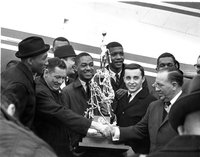 The 1963 NCAA Champion Ramblers are greeted by Mayor Richard J. Daley upon their return to Chicago.